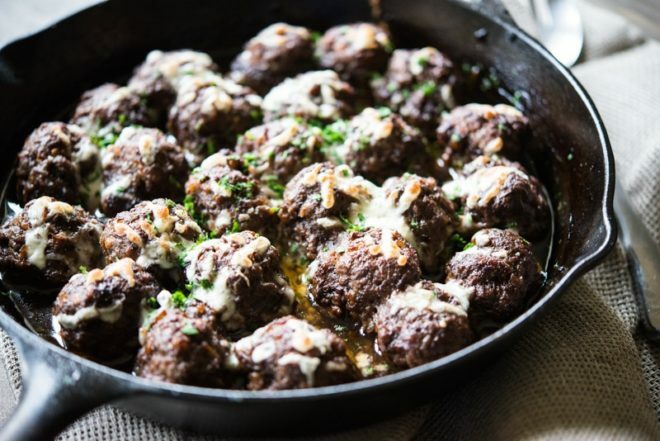 Homemade Paleo skillet meatballs get a delicious makeover with flavorful caramelized onions, a dash of balsamic vinegar, and (optional) sprinkling of mozzarella cheese. 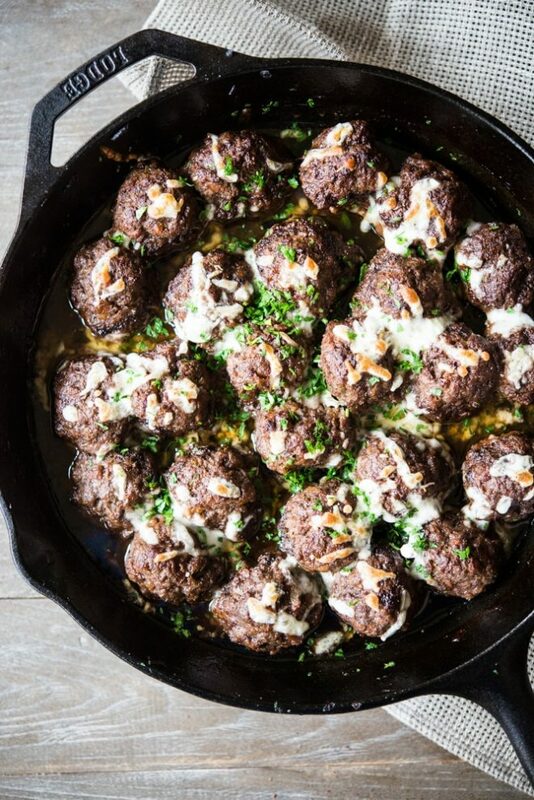 The whole family will RAVE over these healthy skillet meatballs! BOY HOWDY, these meatballs are good. 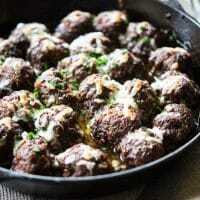 The idea for these meatballs idea came to me while I was menu planning for my Mom's birthday dinner. My Mom is an INCREDIBLE cook. She prefers home-cooked food over eating out every day of the week. Though she's an accomplished business owner in her own right with an exceedingly full-time job (like all business owners), she still finds time to cook breakfast and dinner every single day for herself and my Dad. Every year for my Mom's birthday, she always has one request: can you please come make me dinner in my house? She wants to be home, with a home-cooked meal, but she'd like to experience the other side of the kitchen …the side where you watch someone whip up delicious eats while you sit and sip on a glass of wine. Of course I jump at the offer. I'm convinced food IS my love language; plus, it's not everyday this kitchen master allows me full control of her domain. 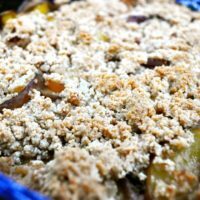 For this dinner, I dreamt up all the foods that are especially “cooked with love.” I landed on a homemade pie (chocolate cream pie is her favorite – a recipe I'll share soon) and something involving caramelized onions. The amount of time that goes into both recipes absolutely qualifies them for a “cooked with love” status. Caramelized onions are a hallmark of French onion soup, but I knew I wanted to make her something slightly more substantial. Something like …meatballs! After about an hour on the stove melting 1.5 pounds of fresh onions into golden, sweet, caramelized goodness, I rolled them in with grass-fed ground meat. The meatballs are then placed back in the skillet I used to cook the onions, drizzled with a little balsamic vinegar, and then baked for a 35 minutes. They come out bubbly and smelling absolutely incredible. IF you're up for it, you can also sprinkle a little mozzarella cheese on top and pop them back in the oven for a short 5 additional minutes to help melt and crisp that cheese into the signature French onion soup finish. 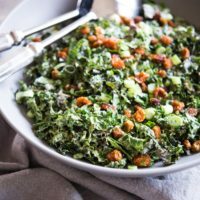 Garnish with a little parsley, serve over zucchini noodles, gluten-free rice noodles (what we did on her birthday), or over mashed potatoes. Melt 2 tablespoons of the butter in a large skillet (cast-iron is a good choice) over medium heat. Add the onions, season with the sea salt, stir, and then cook over medium heat (stirring continuously) for 30 minutes to 1 hour, or until the onions have reduced significantly in size and have developed a deep caramel color. Mix the onions into the ground meat with the black pepper until evenly incorporated. 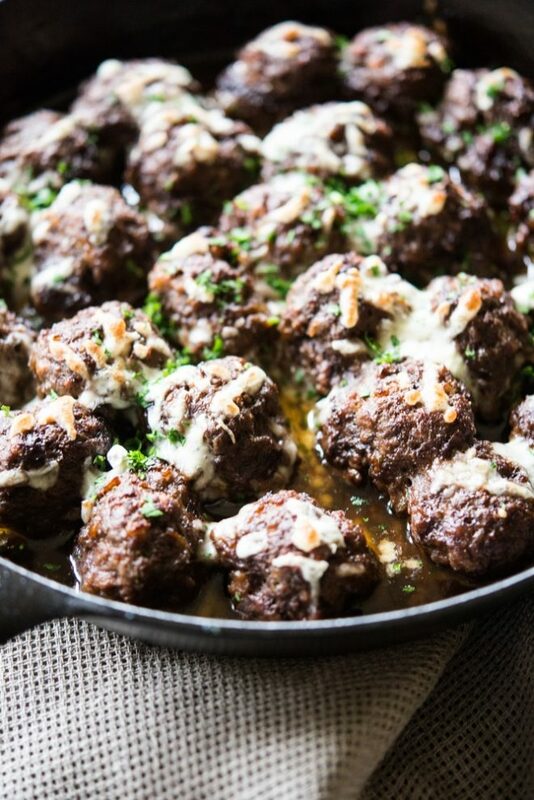 Melt the additional 2 tablespoons of butter in the skillet and preheat the oven to 400 F. Roll the meat into 2 tablespoon-sized meatballs and place them in the skillet. Repeat for the entire batch and then drizzle the tops of the meatballs with the balsamic vinegar. Bake at 400 F for 35 minutes, or until the top of the meatballs are starting to brown. Remove from the oven, add the optional cheese and return to the oven for an additional 3 to 5 minutes, or until the top of the cheese is melted and starting to brown. 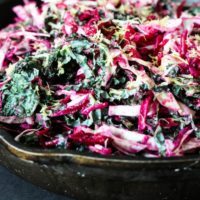 Enjoy warm over zucchini noodles, gluten-free rice noodles, mashed cauliflower, or mashed potatoes. made this last week – my husband usually dislikes my cooking but in this case, A-maz-ING. we both loved it! These look so yummy!! I’m sure these would be great to freeze also! Would you freeze after step 3 or just at the very end of the recipe? 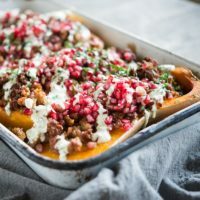 Thinking about serving mine on top of cauli-mash! These came out amazing! I added a little bit of brandy to the onions at the end and cooked it down and some herbs de provence. I love the way this tastes!